If you want a gentle, relaxed day trip, we will shuttle you to the Tekapo B Power Station for a leisurely ride. Starting along Hayman road until you join the off-road bike trail, with Mt Cook as your back drop, follow the curves of the shoreline and the turquoise colours of the lake – oodles of photo opportunity along this section. Biking across the Pukaki Dam, and on to the Visitor Information Centre and carpark (toilets here), this is a great place to recharge the batteries with an icecream or cold drink from the Mount Cook Salmon Shop, and enjoy the final stunning views of Mt Cook, before crossing the State Highway (extreme caution) and the last 10kms across the Pukaki Flats, a dry grassland typical of the Mackenzie High Country, and ending up back to your base in Twizel. An alternate A2O start is Lake Tekapo – a 40minute drive from Twizel to Tekapo, where The Jollie Biker will drop you in the village to begin your cycling adventure…maybe start with a coffee fix from one of the local Tekapo cafes or grab some supplies for the day, before crossing the road to the Police Station, follow the red A2O signs, taking you up and out the back of Tekapo along Aorangi Crescent and Andrew Don Drive – this becomes an off road trail finishing down at the Tekapo A Power Station, and onto the Tekapo Canal Road…literally cycle across the Mackenzie Basin for 26kms, until you reach the Salmon Farm and top of the Lake Pukaki/Tekapo Penstocks….then as per our original day trip, zigzag down to the shores of Lake Pukaki, around the lake front to the Visitor Information Centre, and home across the Pukaki Flats grasslands into Twizel. 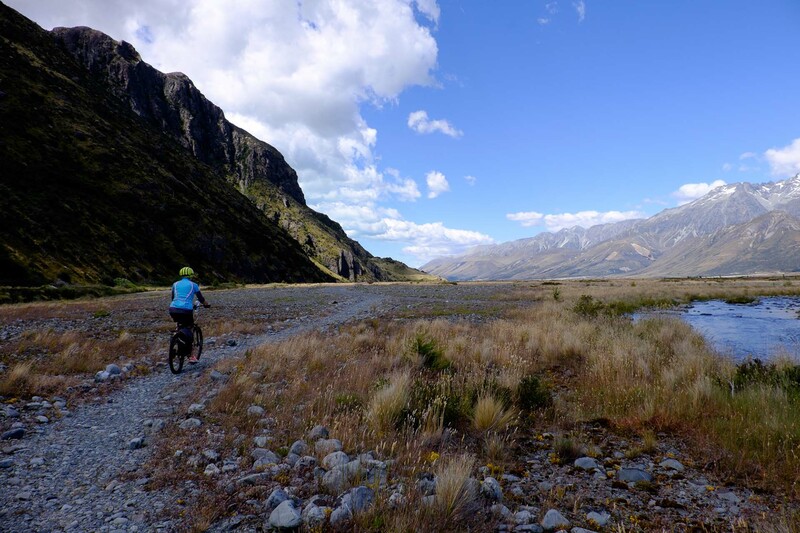 For the ultimate adventure and for the more experienced off road cyclists we will shuttle you to Mount Cook Village where you will start at the White Horse Campsite (the official A2O start), biking a short 7km to Mt.Cook airport. Transfer by helicopter across the braided Tasman River, landing at Tasman Point. From here, 11kms of unbridled high country wilderness as you cycle off-road, with some river crossings, reaching the Jollie Car Park – this joins Hayman Road, (as above) for a 59km ride along the shores of Lake Pukaki to the Visitor Information Centre, and eventually bringing you back to Twizel. Begin your ride in Twizel – 38km cycle to Ohau. Out of town along Glen Lyon Rd to the Ohau Canal, cycling alongside the canal to the edge of Lake Ohau. Enjoy riding on the off road trail along the foreshore. Finally the last section is on road to Lake Ohau Lodge. You may wish to enjoy a sumptuous lunch looking out over Lake Ohau, we can book that for you too. The Jollie Biker will then pick you up for your return to Twizel. Let's plan your fun adventure together!